Ambassador A.L.A. 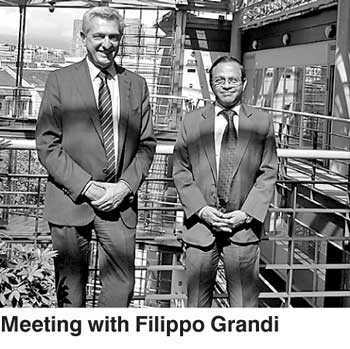 Azeez, Permanent Representative of Sri Lanka to the United Nations in Geneva, met with the United Nations High Commissioner for Refugees (UNHCR) Filippo Grandi, at the UNHCR Headquarters, on 15 August. Recalling the long-standing, productive partnership between Sri Lanka and the UNHCR, High Commissioner Grandi remarked that at a time when there were many challenges around the world, Sri Lanka stood out as a country, which has achieved significant progress in resettlement of returning refugees and IDPs as well as in addressing issues of statelessness. He invited Sri Lanka to be an important stakeholder in the policy making process of the UNHCR, expressing hope that Sri Lanka’s proactive role would contribute significantly to the work of the UNHCR drawing upon the country’s positive experiences and insights. Ambassador Azeez expressed appreciation for UNHCR’s engagement in Sri Lanka in the past, highlighting the different forms of assistance and cooperation such a rewarding partnership had entailed. It was recalled that the UNHCR had built on some of its experiences gained in Sri Lanka in further improving delivery of assistance in other situations elsewhere. Through its policy of constructive engagement and dialogue, and advancing peacebuilding and reconciliation, stressed Ambassador Azeez, the Government of Sri Lanka looked forward to furthering cooperation with the UNHCR, in the context of the Global Compact on Refugees. He also took the opportunity to brief the UNHCR officials on the recent initiatives taken by the GoSL to become a State party to the Anti-Personnel Mine Ban Convention (Ottawa Treaty) following its ongoing successful mine action programme, as well as the Convention on Cluster Munitions (Oslo Treaty), as further expression of Sri Lanka’s commitment to sustainable peace and development.